set to live accordion music. a flash of juggling, 2 pies in the face and a few unruly vegetables. A La Carte begins as the Chef sets the table for the Grand Opening of his 2-seat café. — again and again and again. Who knew crustaceans could cook up such delicious mischief? A La Carte is a playfully interactive comedy featuring clowning, puppetry, music and a few unruly vegetables. A Chef sets the table for the Grand Opening of his one-table café. Before the Chef can dazzle his very important guests, dinner’s main ingredient stages a rebellion — again and again. 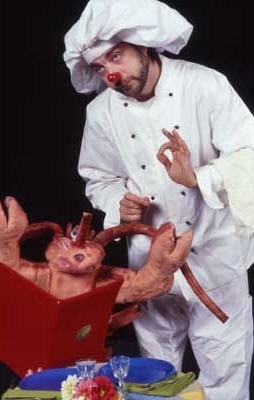 Who knew crustaceans could cook up such delicious mischief? Recommended for ages 2 & up. A La Carte is 40-minute performance combining puppetry, physical comedy and live music. The show travels in a van with three performers who will also load-in and set up. 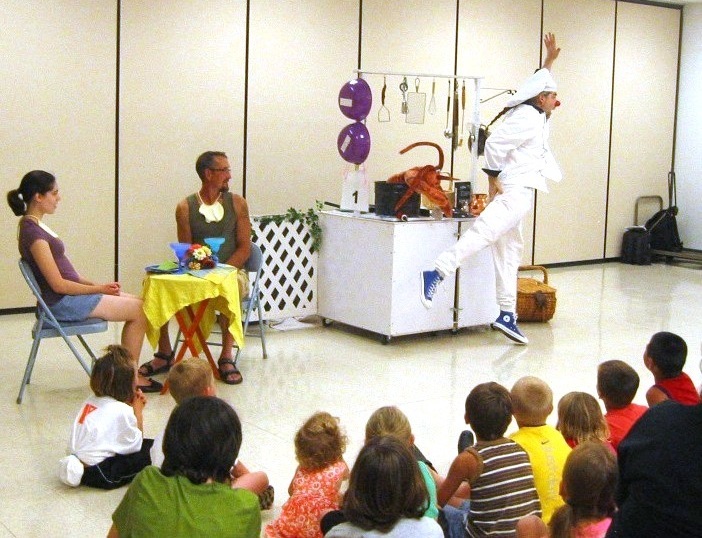 The performers include an accordion player (static downstage left or center), a clown/actor (travels full stage and house), and a puppeteer (concealed within a 3’x 6’ set piece). Set-up can be accomplished in most venues within an hour. A La Carte is designed to be flexible, and can be performed on a proscenium or thrust stage, black box or even outdoors. LIGHTS: A La Carte requires only a general lighting wash downstage covering 8-10’ from the front apron. If available, one special light focused on the boxed area above the set piece. ACCESS: Due to audience participation, we will require easy access from the apron to the house, and house lights kept at least 25% during the performance. SOUND: A La Carte uses two onstage sound sources which travel with it, a wireless headset mic (XLR) and an accordion with direct input. The mic will travel frequently into the house. We may also bring an iPod with pre-show and post-show music to be operated from the sound booth. CLEAN-UP: A La Carte includes carrot peelings, parsley and shaving cream pies which can end up on the floor at the end. Please have a sink, mop and water available for clean up immediately after each performance. WARDROBE: If more than three performances, please have available a washing machine and dryer. DRESSING ROOMS: At least one dressing room with adequate heating and cooling, hot water and toilets separate from public must be provided. PARKING: Parking for one minivan is required. FRONT OF HOUSE: Late seating is allowed. We will require a minimum space of 2’ x 5’ x 8’ tall to set up our Merchandise booth. SAMPLE WORK SCHEDULE: Production requires exclusive use of Theater for duration of load-in and performance. Below is typical for a small to mid-sized theater space. Unusual space can also be accommodated. The schedule below is a sample assuming performances at 1:00 and 5:00 pm. Your schedule may vary, and will be forwarded by our Tour Manager. 5:40 pm: Show ends, Company returns for Q&A with audience, greet children. 1:40 pm: Show ends, Company returns for Q&A with audience, greet children. ...This was the best region-wide performer ever. . . I have never heard so much positive feedback. . . I have never seen kids laugh so hard in a library! AMERICUS — On July 18, the Rylander Theatre will present “Z Puppets Rosenschnoz,” a puppeteering clown troop from Minnesota. Rylander director Heather Stanley said in a phone interview Friday that Shari Aronson and Chris Griffith from Z Puppets will perform at the theater following a week-long residency at the Center for Puppetry Arts in Atlanta. At 10 a.m. Monday, Aronson and Griffith will present the “Secret Life of Puppets” workshop which will teach participants the “tricks to turning sticks, cloth, strings and even your hands into live characters.” The workshop is intended for ages three and up. The group will participate in individual and group puppet improvisation and learn movement exercises that mechanize puppet's breath, gestures, actions and reactions. Stanley says registration for the workshop is $10 and is limited to 30 participants. In addition, registration to workshop includes a ticket to the evening Z Puppets Rosenschnoz Show. 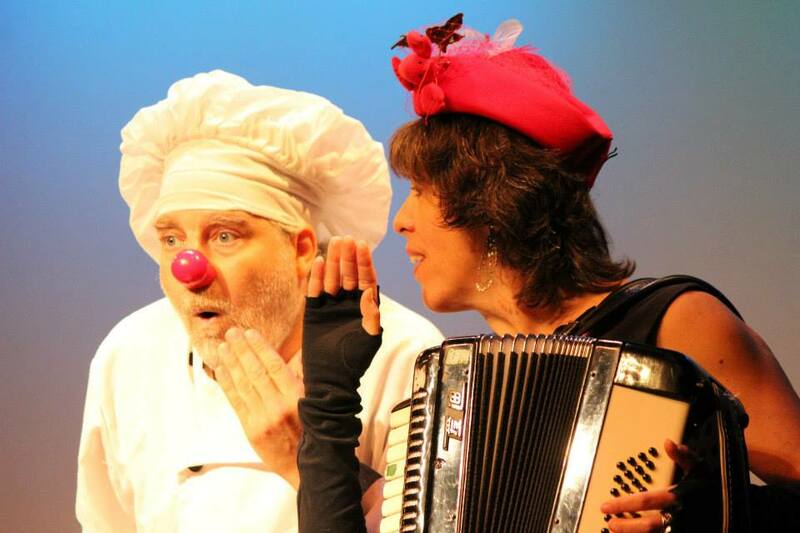 At 7 p.m. Aronson and Griffith will perform the full length “A La Carte: In a Fool’s Kitchen,” a comic battle between a fake French chef and a mischievous and rebellious lobster set to live accordion music. Stanley says that the “highly physical” Z Puppets Rosenschnoz shows are immensely entertaining and are fun for all ages. “It’s not just for kids and you don’t have to have a kid in tow,” Stanley said. She described the troupe as typical of the European notion of clowning with much improvisation, miming and slapstick. “We are excited to have a show like this in the summer,” she added. Stanley said that the Z Puppets Rosenschnoz show is unlike anything that the Rylander has featured in quite a while. She hopes that this kind of programming in the summer months provides opportunities for families to come and enjoy an evening at the Rylander. “This is going to be a good all-around family activity,” she said. Tickets are General Admission — $15/adults, $10/children. Workshop participants ticket to the 7 p.m. performance is included with workshop registration.